This civic organization works for the benefit of enlisted persons, active or retired, from the Navy, Marine Corps and Coast Guard. The group sponsors civic, social, and community activities. The Southern Maryland Leathernecks Detachment is a local chapter of the Marine Corps League, a veterans service organization. The Southern Maryland Leathernecks are active in youth community and veterans programs throughout the southern Maryland area of Calvert, Charles and St Marys Counties. Regular monthly meetings are held at the American Legion Post 82 on Rt. 301 in La Plata on the 1st Wednesday of every month. 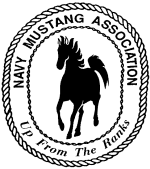 The Southern Maryland Mustang Association is a chapter of the National Navy Mustang Association. We are a professional organization of United States Naval and Marine Corps Officers who came "up from the ranks" from enlisted to serve as commissioned officers in technical managerial positions. What does the organization provide? Like other military organizations we feel strongly about our responsibility to mentor young Sailors and Marines to develop future Mustangs. Additionally, we have a strong commitment to serving our civilian community. We do this through personal mentoring, charity, donations and community service programs. We are busy professionals that find fulfillment in helping others. Much of what we do would not be possible without the support of the local business community. Thank you for your superb support and donations that enable us to serve our community and military family. U.S. Coast Guard Auxiliary, 5th Southern Distr., Division 23, Flotilla 2, Slomons, Md.